Home / Blog / Do You Need Traditional CMM Or 3D Scanners? Do You Need Traditional CMM Or 3D Scanners? For more than five decades, the coordinate measuring machine (CMM) has been the point of reference for accuracy in measuring compact objects. However, in the last two decades, a new technology emerged known as 3D laser scanning. The new technology arrived on the scene with more point capability, power, size and price value that are way better than traditional CMM technology. 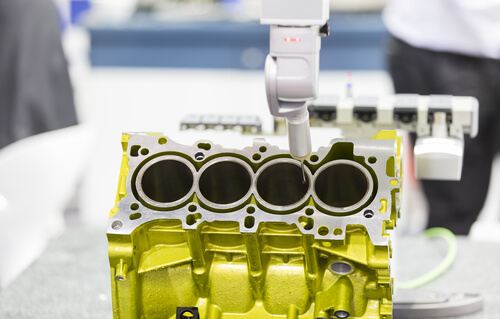 Companies have been relying on CMMs or 3D scanners to collect vital data and measurements on parts to ensure they are accurate and eliminate any inconsistencies. 3D laser scanners allow a collection of points that can be read both internally and externally. It uses the same technology used for CT scans to take measurements on a variety of materials using an array of techniques. 3D scanners are used on various types of fabric materials, fibre, wood, elastomeric, thermoplastic, composite, and metals. With 3D scanners, you can explore internal parts of a thick aluminium casting, archaeological finds, packaging, fine art and even prepared foods. In contrast to traditional CMM techniques, 3D scanners capture all surface points even the most complex, intricate surface areas. It is very easy to miss certain critical points using CMM deviation points when checking on parts which can easily make an engineer believe that the part is perfect. However, if you perform a quick 3D scan on the same part, you can quickly determine whether the object is out of spec on several faces. Once you identify any anomalies, you track back the problem to production source and have it rectified. 3D scanners have helped a number of manufacturing companies from losing a lot of money from having to deal with faulty parts. This does not mean that the CMM technology is no longer useful. Many companies still use it in their operations for certain measurements in various applications. It is important to note that the same software used to manipulate data from the CMM can also be used with 3D scanners. Most companies are still holding back from making the change from using the CMM technology to buying the new 3D scanning devices due to the costs involved. However, when a company invests in 3D scanners, the transition from CMM to 3D is more economical and makes more financial sense. There are driving factors when evaluating the purchase vs. service issue. One of these factors is raw cost. The cost involved when using a 3D scanner is typically half the cost since the CMM needs a company to include the costs of experts who have to run the machine. 3D scanning allows companies to produce first article inspections, inspections, colour maps or other outputs. With all these data, a company use the data for various purposes for different applications. 3D scanners are becoming popular because they do not require contact with the surface of a part. They are quite mobile and their lightweight, handheld sensors means that they can be used virtually anywhere. They boast accuracy in the range of 0.1 mm to 1.5 mm and they have the ability to capture up to hundreds of thousands of data points per second. Unlike the CMM technology, 3D scanners are appropriate for collecting data on delicate small surfaces with highly complex shapes.